Why so serious? Nothing is that serious at MorphCostumes but we do take Joker costumes very seriously. The character has been involved in popular culture since 1940 and shows no sign of disappearing, he is often argued as the best villain ever written. The character’s origin is that he doesn’t have one. In each run of the comics he features in (of which there are many), he has a new origin. This is what makes him so incredibly menacing; as much as we hate to admit it, humans need to know where someone comes from in order to understand them and we can’t understand the Joker. If we think that we do, we are wrong – look at Harley Quinn. Dr Quinzell tried to understand him but he lead her to believe he was someone else. He turned the doctor into his villainous possession and caused her to go insane. But we don’t think we need to understand him to dress up as him. Here is a guide to dressing up as the Clown Prince of Crime – we hope you like it, and we hope you get the joke. The beginning of the joke. There are loads of interpretations of the Joker but there are a couple that make the best costumes. There are four ages of comics: the golden, the silver, the bronze, and the modern age. 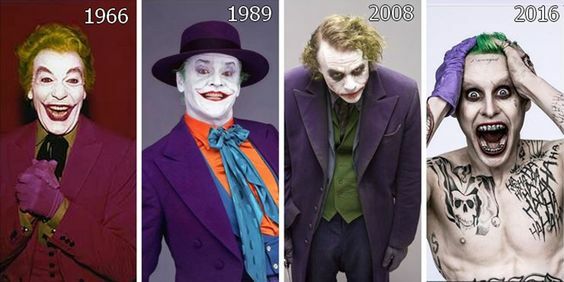 Each age had a new interpretation if the Joker’s personality; the golden age (1938 – 1950) saw mobster Joker, the silver (1956 – 1970) saw him to be the Prankster equipped with the silly props and getting one over on good ol’ Batsy, and both the bronze (1970 – 1985) and modern age (1985 – present) saw him become the psychopathic Joker that we all know and “love”. Which Joker you chose to be is up to you, so we will give you an example of each from the comics. The Golden Age saw a 40s criminal mastermind, who wasn’t opposed to killing a few people to make sure his plan went off without a hitch. The character was gritty and serious but his victims would die with a smile on their faces – his signature since 1940. As you can see the character looks extremely sinister, with the signature elongated smile and aggressive widow’s peak but what defines the golden age Joker is the heavy bags under his eyes. Inspired by 1928 film The Man Who Laughs this Joker wears a purple suit with a green shirt and neck-tie beneath, his weapons as blunt as he was. In an early comic, the Clown Prince beats Robin with a crowbar, just for fun. It’s all very solid – solid costume, solid colours, solid character with a solid trope. This all began to change when comics entered the Silver Age, due to the aftermath of WWII and the Korean War, comics began to be less gritty and more fun. Heroes began fighting aliens rather than the real threats: people. The Joker stopped being gritty and blood-thirsty and his ambitions shifted – all he wanted was to get one over on Batman. His plans were outrageous, his schemes were questionable, and he lost the fear factor he had during the Golden Age. His costume was even exaggerated; the Silver Age saw the introduction of the orange elements in addition to the usual green and purple into the Joker’s costume. The character gained the silly prank gadgets he is known for today such as the acid-spraying lapel flower and the lethal hand buzzer. This phase began to disappear when the Bronze/Modern Age came into play. As war fear began to fade away, things were gradually got a bit darker again and then the darkest it’s ever been. Thanks to the introduction of Arkham Hospital, later to be Arkham Asylum, in the beginning of the Bronze Age the Joker could be reborn again. His trips in and out of the institution began since Arkham’s creation. He went to hospital rather than prison and this was the beginning of the twisted, sadistic Joker we know today. The Joker who cannot live without the Bat because if the Bat is dead then what purpose does he have? The Joker and Batman are meant to be together, at least the Joker can admit this. There have been many crazy brutal Joker storylines over the years but (not regarding the controversial The Killing Joke comic) one takes the cake. 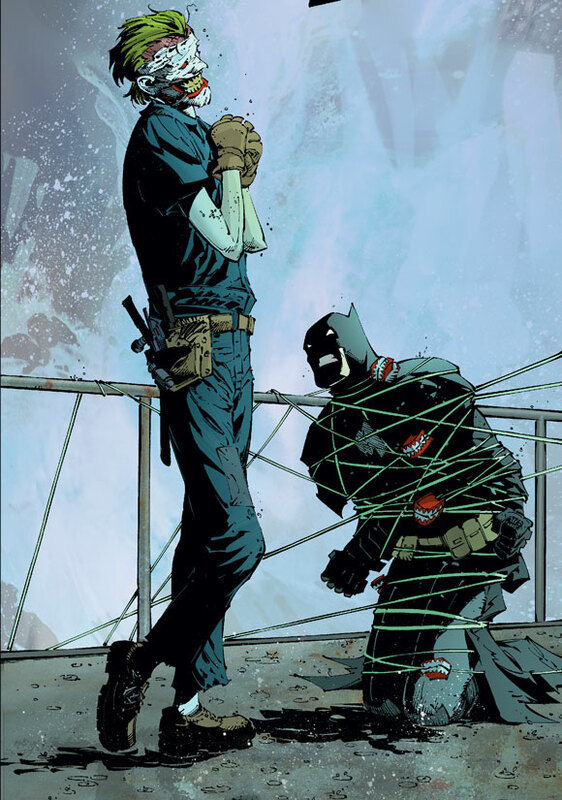 The New 52 run of Death of the Family welcomed the Joker back into main comic continuity, in which he aims to destroy the Bat-family so that he and his beloved Batman can be together. However, his madness was turned to 11. He removed his own face to wear as a mask – for fun – and for a lot of the comic is dressed in a boiler suit. Imagine what he could do to others when that’s what he does to himself? 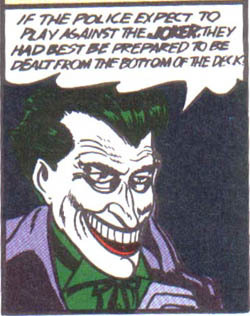 Overall, the Joker in the modern age is creepier looking than he ever did in the 40s. His smile is wider, his jaw is longer, he is leaner and taller. He is more sinister and madder than he has ever been, crueler to on-again, off-again lover Harley Quinn but more obsessed with Batman. He is Golden Age Joker turned to 18, not simply 11. His costume changes with each issue but you’ll never go wrong with a tux. In a simple black tux with a carnation flower in your lapel complete with the white skin and lime hair, it’s impossible to get the Joker wrong. Especially if you can get yourself a Harley Quinn, or a Batman, and we have you covered for both costumes. The original screen adaptation of the Jokester. Cesar Romero’s personification was the live action Silver Age Joker. Campy, elaborate, over-the-top. His mad schemes were laughable and not at all a sliver of the villain he is today. Romero refused to shave his ‘tash for the role so the paint was applied pretty thick. We would recommend putting a little bit of black or green lightly through the eyebrows after the white paint, just to make you look somewhat human again. Romero’s makeup is very simple as his smile was applied with what looks like a pink toned red lipstick and his eyes defined with a black kohl eyeliner. Combined with the light lime green do, the fuchsia 3-piece suit and glove combo, and a forest green shirt you’re ready to clown around playing all the tricks. Many people say that Nicholson’s Joker is the only Joker for them, akin to the debate over which actor played the best Doctor in Doctor Who. Nicholson’s personification of the gritty mobster of the Golden Age was genuinely quite terrifying. The sinister giggle and permanently stretched, thin lips mixed the bright costume of Romero’s time but dirtied it up with the homicidal tendencies that the Golden Age Joker was famous for. Nicholson’s Joker costumes elaborate and formal, there are many to chose from in one film alone. Our favourite is probably the costume from the scene with the famous line “You ever dance with the devil in the pale moonlight?” The purple and green trews are brilliant – we do hail from Scotland after all! Combined with an orange silk shirt, teal accessories, leather gloves, and a purple coat-tailed jacket you’ll definitely win a best-dressed award or two. The one who changed it all. Ledger brought the twisted clown of the Modern Age to life and truly brought his madness to life. It’s director Christopher Nolan’s interpretation that you can begin to understand that you will never understand the Joker (due to the different stories he tells when he asks “You wanna know how I got these scars?”). This interpretation is so insane that you think he may not be, he is almost stable, just a brilliant anarchist – it’s possible to understand why Harley is so drawn to this character. Many criticise Ledger’s Joker for being too serious but we don’t see it that way. The Agent of Chaos has become possibly the most iconic edition of the Joker and The Dark Knight only came out in 2008. Latex scars, stringy bad-dye-job hair, and water based face paints with a little too much water are famous for their role in 21st century films and acting itself. The Ledger costume is intricately simple; there are a lot of different patterns and shades of purple to get right. Pinstripe, leather, hexagons, polka-dot, dark purple, indigo, the beautiful rich green waistcoat. It’s brilliant when it’s done right. Or you could go with the costume from one of our favourite scenes – get yourself a ginger wig and a nurse uniform, apply the makeup and you’re done. Heath Ledger’s infamous Joker is a difficult costume, we won’t lie. Well, whatever doesn’t kill you simply makes you stranger. This Joker caused a lot of controversy. The Snyder run of DC films have come under fire an incredible number of times and the recent Suicide Squad was no different. Jared Leto’s tattooed Joker annoyed a lot of fans because it supposedly contradicted the character, but in a way it fits. This look was unpredicted and different and a little off-putting, and it made you talk about him. Isn’t that what the Joker would want? A reaction? Throughout the film, Leto wasn’t seen that often. It’s been said that there will be more of his character seen in deleted scenes which we can’t wait for! The character is probably a mix between Golden Age and Modern Age Joker, in our opinion, and we think it could work for the world Zack Snyder has began to build, then again we didn’t see him enough to get a good enough judgement. The Mobster of Midway has a somewhat difficult costume due to the intricacy of his tattoos. However, if you wear the red shirt and silver blazer, you can hide quite a lot of the highly intricate designs. So long as you remember the hand tattoo, the bright red mouth (no scars for this edition), the neon green hair, and the blocked out brows – you’re sorted. Again, the ‘Damaged’ tattoo on the forehead is optional, it can prove difficult to write in that delicate prose backwards in the mirror. The Animated Series saw the Clown Prince of Crime fall into the vat of chemicals that is often teased as one of his potential origins. 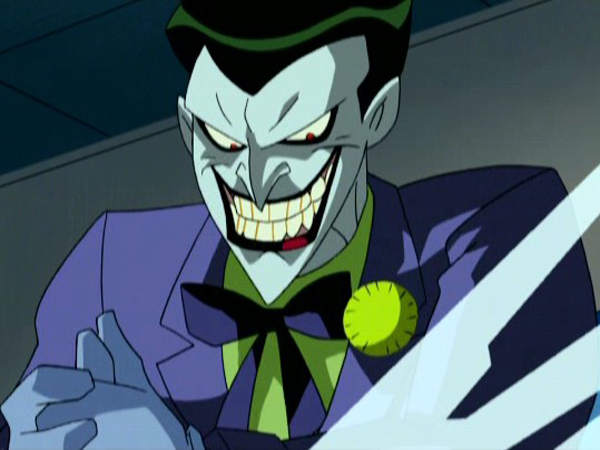 Voiced by Luke Skywalker himself, Mark Hamill is a firm fan favourite casting of the Joker, additionally it was this animated Joker that welcomed the arrival of his play-thing now popular DC character seperate from the Joker, Harley Quinn into the DC universe in the episode Joker’s Favour. This version of the character harks back to the original costume of a simple solid purple suit with a green shirt/waistcoat, accessorised with a dark green bow tie and carnation in the lapel. As a result of falling into a vat of ACE Chemicals, his skin is permanently white with a purplish hue and his smile widened into the menacing smile we know so well. His almost black green ‘do is a very particular shape, not unlike Wolverine’s. The character went through three redesigns but two out of three, both his eyes and his teeth are yellow. You can do this by buying teeth colours/enamels on most SFX websites, usually the nicotine kinds will be best for this. For the eyes, you can either buy black and yellow contact lenses or by buying yellow contact lenses and just heavily changing the shape of your eyes with eyeliner to make them deeper and more triangular. We are showing you this guy for inspiration and basically, just because he’s incredible. You’ve probably seen this guy floating around the internet for his insane cosplays of the Clown Prince of Crime. Anthony Mislano is an actor living in the US and chose to don the smile for the first time at San Diego Comic-Con in 2012 after spending a year making the costume. Since, he has made and redesigned his costumes for the character many times and has teamed up with many other cosplayers including real life girlfriend and Harley Quinn cosplayer, Alyssa King. 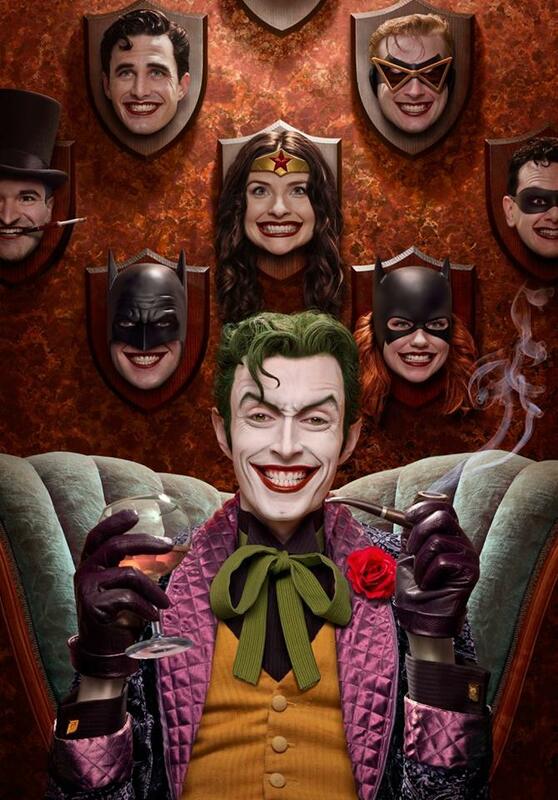 We can’t get over his real-life depiction of artist Brian Bolland’s illustration “Joker’s Trophy Wall”. SO INSANE. Just because the Joker is male doesn’t mean you have to be to dress up as him! Gender-bend Jokers are some of our absolute favourites, especially if they’re ones that already exist. Take Duela Dent, the Joker’s Daughter. Or maybe Catwoman’s daughter, or Doomsday’s daughter, or… You get it. Her parentage has been played around with since her introduction in the 70s but in most versions of the character, she is alluded to be the Joker’s offspring. In the New 52 run of comics, the character found the face of the Joker that he got removed after Death of the Family, in the sewers of Gotham. This woman, who was never given a name, soon became obsessed with the idea of being the daughter/legacy of the Clown Prince of Crime. She forced the Dollmaker (the villain who cut off Joker’s face in the first place) to sew the face onto her own and since has become a criminal inspired by her so-called ‘father’. She also became a member of the Suicide Squad, much to the dismay of fellow Squad member, Harley Quinn, who is a recovering victim of abuse and is upset that Joker’s Daughter wishes to be like the Clown Prince of Crime. Joker’s Daughter/Duela Dent has had many costumes over the years but we will focus on the New 52 costume. If you have short hair, this one will be ideal for you as so many gender-bends have long hair and it’s rare to find a kickass ‘bend with short. Anyway, dye it or spray it or (ideal for light hair) chalk it pink. Get a purple t-shirt with ‘Daddy’s girl’ emblazoned ideally but it doesn’t have to be, and combine this with long purple evening gloves, ripped purple leggings, a red mini skater skirt, a green sleeveless coat and purple boots. Once you paint on the mask, complete with stitches and a little bit of blood around the edges, you’re eerily creepy and ready to go. Another weirder genderbend from the comics is, believe it or not, Batman’s mother. In the Flashpoint timeline (in which The Flash meddled with time to save his own mother and changed the timeline of the whole DC universe), it was Bruce that was shot in the alley, not Martha and Thomas. Out of grief, she began to lose her sanity and after Thomas’ wish to see her smile again, she cut her own face to command his wish. She grows to blame Thomas for Bruce’s death and commits the worst of crimes as the Joker to hurt her husband, who has become the Batman. 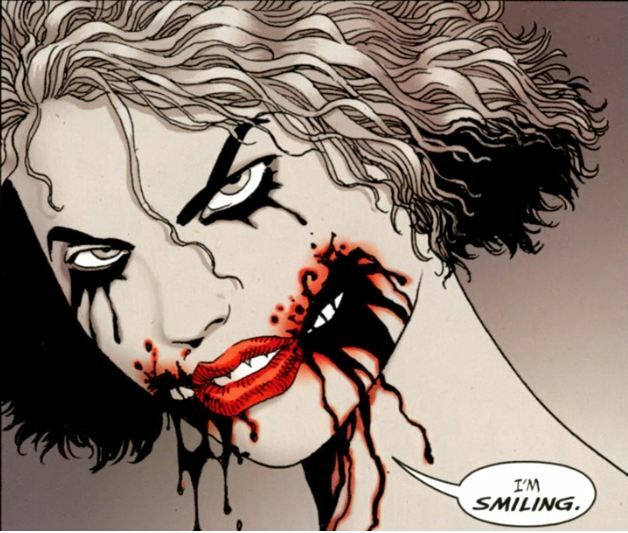 Martha Wayne is one of the scariest Jokers because she is so human about her madness, and it’s heartbreaking. The split scars of Martha Wayne were self-inflicted therefore they were messy and her Chelsea smile is not split right from the edges of her mouth. Her costume resembles the one worn by Heath Ledger so this costume can lend to both Nolan’s Joker and Flashpoint’s Joker. Of course all of the different versions of the Joker can easily be gender-bent; you just have to wear the costume and bent! Now, you’ve seen why we take our Joker costumes so serious come Halloween. Thing is, we haven’t talked about half of the different Jokers across the media, considering individual runs, different artists, video-games, the different TV adaptations and so on. Genuinely we could be here all day. If you do choose to dress up as the Clown Prince of Crime this Halloween or if you found this article useful, please tell us! We adore seeing your pictures and Instagram posts, we would love to feature you on our Inspiration pages of our website. Are you ready to introduce a little anarchy, upset the established order and ensure everything becomes chaos?